We carbon steel Y strainer manufacturer has widespread our influence in the foreign countries with the backing of our experience and expertise in manufacturing outstanding quality carbon steel Y strainer. This carbon steel Y strainer are extremely used in the oil and petrochemical industries for sharing the excellent resistance against thermal and mechanical shock, which is essential to prevent the fire caused by the thereof. Other than, the chemical resilient nature of the carbon steel prevents rust that is one of the reasons for the contamination and early clogging of the strainers in the fluid stream. Undoubtedly, the strength of the carob steel is far greater and that’s what makes it excellent under the high pressure surroundings. 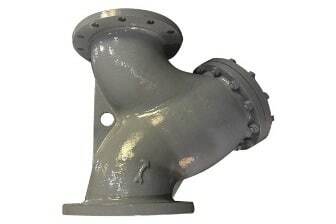 The offered carbon steel Y strainer is establishing the strong position in the India and other countries for delivering the impeccable performance across the life span, other than the self operating aspect of our carbon steel Y strainer removes the manual cleaning of the strainer and thereby ensures absolutely flawless performance. This carbon steel Y strain is available in different perforated screen sizes and also in the different capacities, ranging from 150 psi to 3880 psi operating pressure, which has 100° F maximum temperature endurance potential. This carbon steel Y type strainer meets all the international standards of quality and tested and ensures to be leakage free, which one can avail in India as well as other countries.